The other day I was in the mood to cast on for something new and fast, so I took a skein of seasilk I got a while back and started a second Swallowtail shawl. The first one was really fun and only took about four days. This one is taking a little longer, but that's okay. 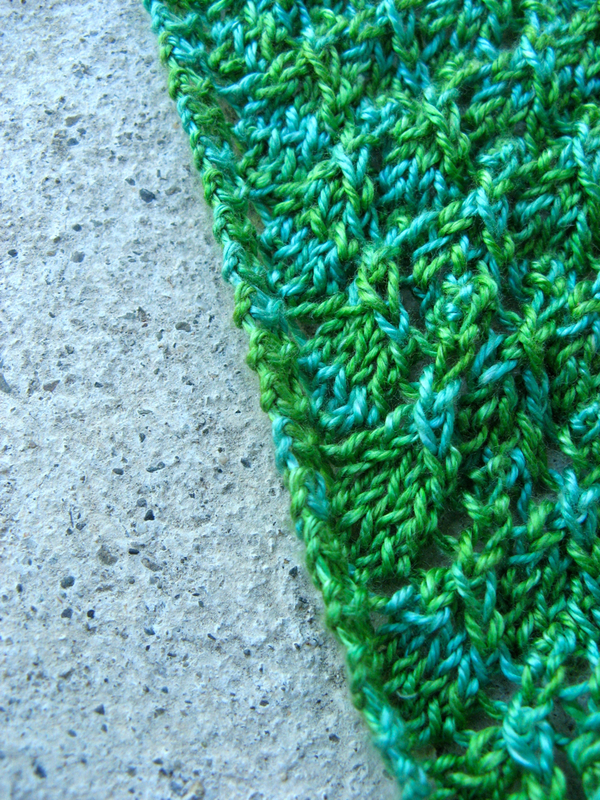 Swallowtail is the potato chip of lace knitting: easily memorized chart, a couple nupps thrown in for fun, and done before you know it. This is the second time I've worked with a seasilk yarn. The first was Handmaiden Seasilk, which I loved working with but found a little bit sticky, especially on the brass Addi Turbo Lace needles. This seasilk is from Etsy seller Lunayarns, who I posted about before here. The colorway is a lovely combination of apple and minty greens. 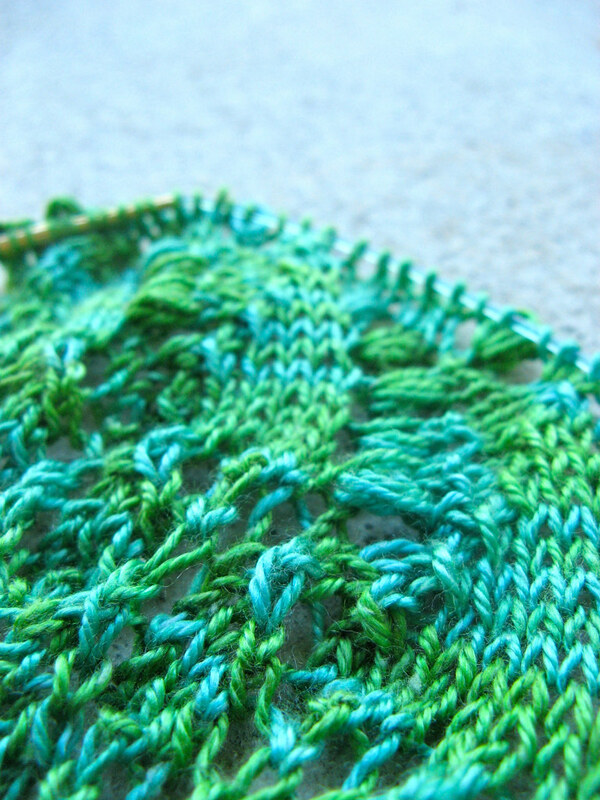 I love how subtly variegated yarns add depth, particularly to lace. I've also found that this yarn is softer and smoother than the Handmaiden. 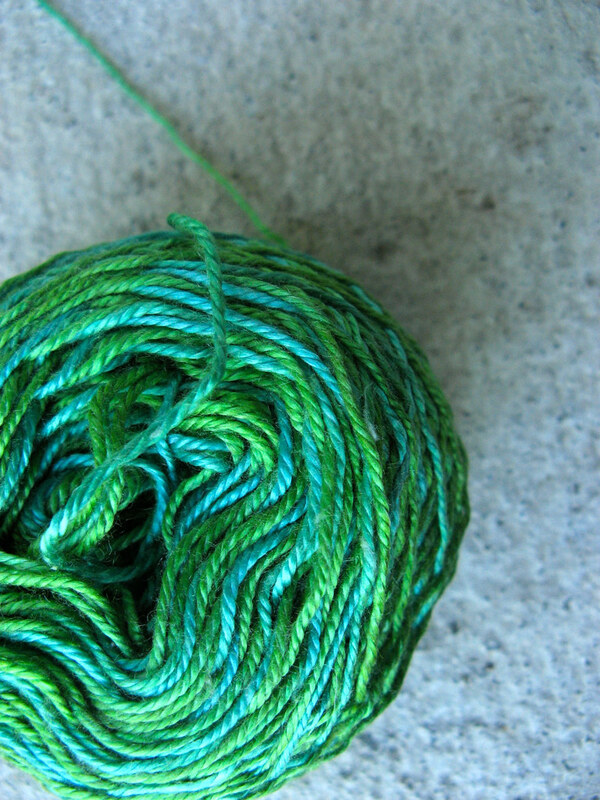 As with most seasilks, there are little slubs of fiber in the yarn. They're relatively easy to pick out. When I was at work the other day I heard someone complaining about these slubs on a Handmaiden yarn, but to me it's just part of working with this fiber. Just like stockinette is nice and flat, but curls like crazy, there are certain things you just have to accept about certain fibers. Whether or not that's a dealbreaker is a really personal thing. For example, alpaca is not one of my favorite fibers. I love the softness, its warmth, and its particular sheen, but I don't like how limp and flat it can be, especially after it's been worn. Because of that, I'm more careful when selecting alpaca yarns. For some people, those positive attributes completely outweigh the negatives - it's just an issue of personal taste, and luckily for us, the yarn market is diverse enough to provide for all sorts of preferences. The only thing that's ever a true dealbreaker is dye that isn't properly set even after washing. 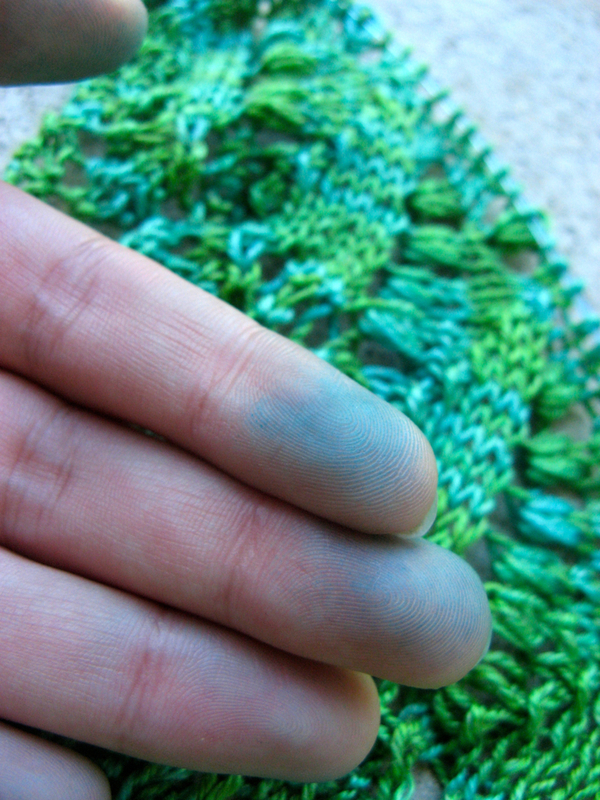 I was listening to Doubleknit #54 the other day and they were talking about Jessica's Damson (rav link) that was indigo dyed and turned her hands blue as she knit. The final verdict was that the dye was set improperly, and that it would never really stop bleeding. Definitely not good to put that much work into something only to have it ruin your clothes! This yarn has been bleeding on my fingers as I knit, but I'm hopeful that there's just a little dye that wasn't exhausted and a good washing will solve the problem. I might also talk to my mom and see what I could use. I've heard that Synthrapol kills the texture of silk, but I might try adding some vinegar to the bath if the regular hand-wash detergent I use doesn't work.